An Endpoint is used in Interaction diagrams (Sequence, Timing, Communication or Interaction Overview) to reflect a lost or found Message in sequence. To model this, drag an Endpoint element onto the workspace. 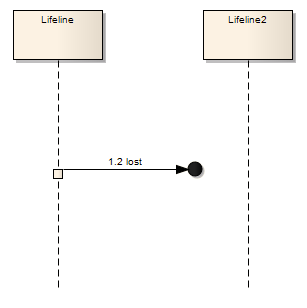 With Sequence diagrams, drag a Message from the appropriate Lifeline to the Endpoint. With Timing diagrams, the Message connecting the Lifeline to the Endpoint requires some timing specifications to draw the connection. This example depicts a lost Message in a Sequence diagram. A lost message is a message where the sending event occurrence is known, but there is no receiving event occurrence. We interpret this to be because the message never reached its destination. A found message is a message where the receiving event occurrence is known, but there is no (known) sending event occurrence. We interpret this to be because the origin of the message is outside the scope of the description. This may, for example, be noise or other activity that we do not want to describe in detail.